Having two monitors may sound like something from the movie "Hackers", but the reality is far more day to day. After all, how many times have you had a document on the screen, and you needed to switch to your web browser or a spreadsheet - you can only see one at a time - unless to reduce each window size, which is not really a viable solution. The answer to this problem is more screen space. Of course, you could by a bigger monitor - this does work up to a point - the point where you run out of resolution on one monitor. But adding another monitor, especially having two large monitors, gives you a totally different vista (no pun intended!). With two monitors you can have your browser and massive spreadsheet on screen at the same time. You can be viewing a large webpage and pasting text into your PowerPoint or Word document. In short, having two monitors dramatically improves your productivity. 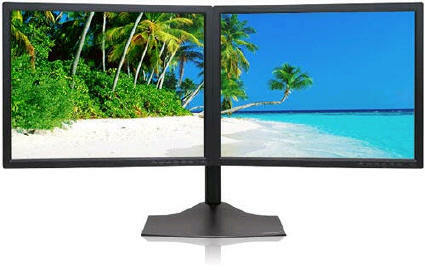 They can be the same or totally different - two LCD, two tube monitors, one of each. They can also be different resolutions, and different physical sizes. 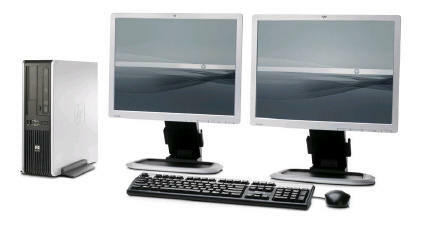 To easily setup dual monitors you can use Windows 2000, but it is much easier with XP or Vista. The second card can be a simple VGA or higher resolution state of the art NVIDIA video card. Of course, some PCs come with dual monitor support (2 video cards/outputs) built-in - so check you system before buying a second video card. If you have two LCD monitors with VESA compatible mounts, a dual monitor stand makes sense - it saves desk space and mounts both monitors at the same level for better use. That's it. However, it is recommended to extend the RAM memory in your system to 2GB, as each screen will use memory - but even on a 1GB main memory system, dual monitors work wonderfully.